Probiotic’s, cultured, fermented food – its all the rage. So we thought we had better get on the band wagon! Talk about old becoming new again. Captain Cook used sauerkraut to ward off the scurvy in his crew in the 18th century. Now us 21st century mothers are whipping up batches of fermented & cultured foods for our families to ward off the winter flu’s & keep stomach bugs & germs at bay. My little one loves her “fairy cabbage” (as sauerkraut is known in our household) & would eat it by the cupful if I allowed it, but I am worried that there may be some stomach consequences, so I only allow her several tablespoons with her meals. This Sauerkraut recipe is so easy that you will probably doubt that it works!! But it works, we are on to our fifth batch & going strong. 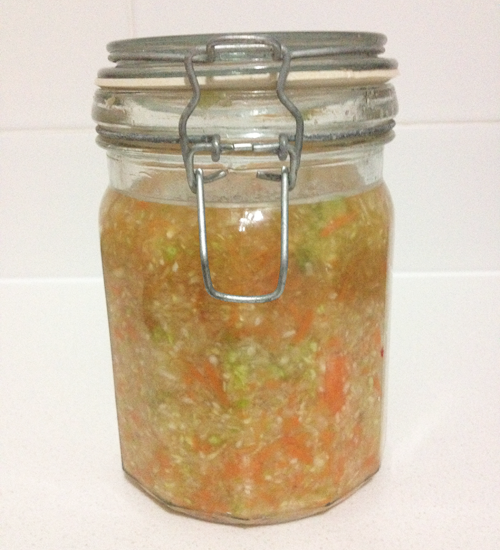 This recipe makes a trial sized version – one 750ml jar serving. I think its best to start small & once you have your sauerkraut fermentation time down pat, then make large batches. Shred all of the vegetables & place in a bowl – I use a food processor to grate the vegetables as this is the way my “little one” likes it best & it also makes the next stage super easy. Add the salt & any spices you care to use to the bowl. 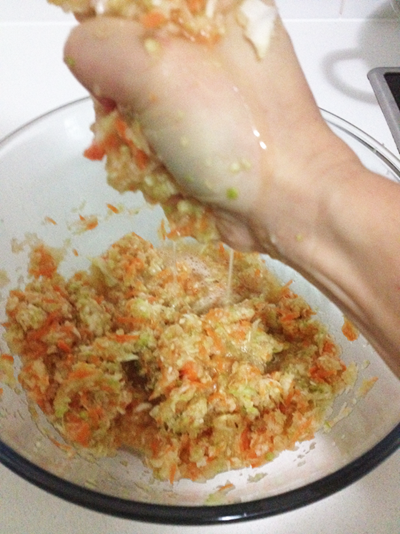 Then knead, squeeze & pummel your vegetables to bruise them & release all of the juices. 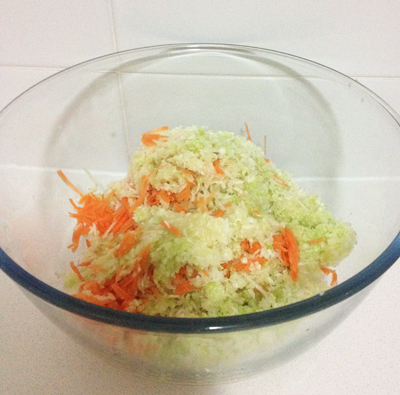 This can take 2 to 10 minutes depending on how fine you have shredded your vegetables. Using a food processor to shred your vegetables seems to speed up the process. 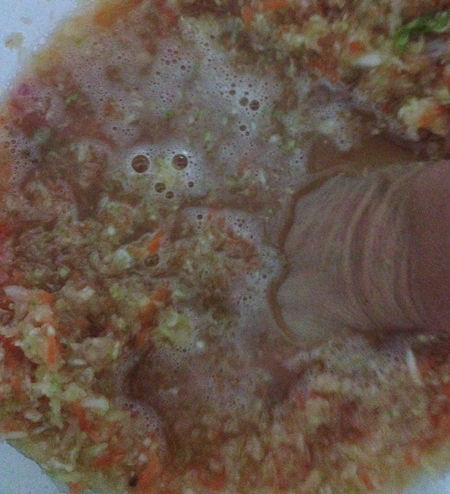 Once the vegetables have released all of their liquids like in the picture below. You can begin to pack your sauerkraut into your jar, pack the vegetables in tight & pour over the juices that you have squeezed out. Secure the lid & place the jar in a dark place & leave it to ferment for 3 -5 days, taste each day from the second day & when it reaches the desired flavour place in the refrigerator & start using. I find the longer you leave it out to ferment the stronger the flavour becomes, we normally refrigerate our Sauerkraut on the 3rd or 4th day. The sauerkraut tastes really good after a month in the fridge if you can get it to last that long. As with all fermentation its a little scary at first, leaving food out at room temperature WTF!! But once you have done it a few times I promise it gets easier. With all fermentation use your common sense if it smells putrid or starts to grow stuff it might need to be scrapped & start again from scratch. Lots of people attest to just scooping off mould etc that grows on the top of the jars, I am not quite there yet!! But in time who knows…..
We love jam around here. But as her Mama I know that what she really means is, “can I have some yoghurt with my jam?”. She would eat straight jam by the bowl full if only her pesky Mama would let her. Peel, core & quarter your apples place them in a pot with your 3/4 c of water & lime rind, let it start to simmer. Peel & quarter your kiwifruit & add them to the pot. When all of your fruit is cooked through, pour your mix into a blender to puree or use a stick blender to make a smooth paste. Add your stevia to taste & return your fruit puree back to the stove for a further 10 – 15 minutes simmer time to get the flavours to infuse. Then remove your fruit puree from the heat, add your vanilla essence & chia seeds & stir through. Pour the mix into sterilised jars & leave out on the bench to cool. Once cool refrigerate & leave overnight for the Chia seeds to do their work & turn your puree into jam. 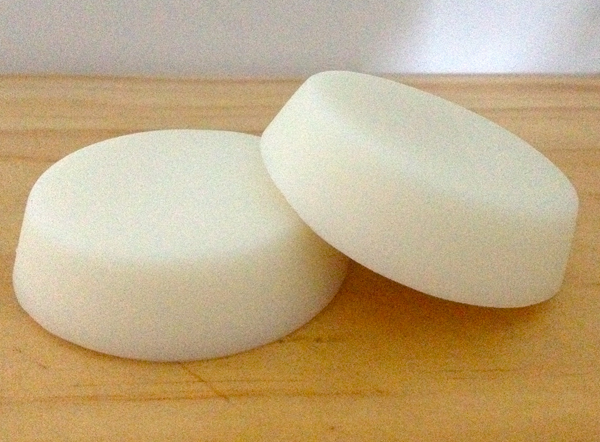 Enjoy yummy, creamy smooth, fresh tangy jam. 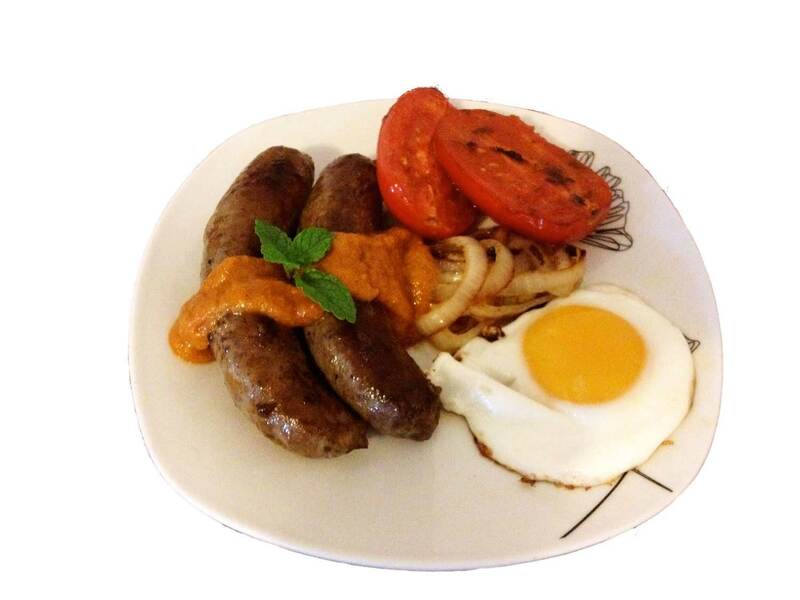 Healthy Sugar-Free tomato sauce – I kid you not! Tomato Sauce is not a condiment, it is one of life necessities! Just ask my “little miss” who dips her chips in Tomato Sauce & then licks them clean, only to re-dip the chip. She would gladly sit down to a big bowl of Tomato sauce for dinner, if only Mama would let her. For this reason developing a healthy tomato sauce recipe was an “Urgent Priority” when we decided to kick all the chemicals, additives & nasties in our diet. Making a yummy tasting tomato sauce without SUGAR is a tall order. But this sauce tastes so good – you won’t believe its healthy & you will never go back to that icky red stuff that comes from a bottle! The only problem with this scrummy sauce is that without all the colourings that come in supermarket sauces, it’s a little meek in colour. But what it lacks in colour, it makes up for in flavour! “Little Miss” approves & has given the sauce her two thumbs up (kids equivalent to a 3 hat Restaurant rating). And she is still double dipping those chips!! Let me introduce you to tangy, tasty, heaven in a bottle. Brown onions & garlic in a little olive oil with a pinch of salt & pepper in a saucepan until they are caramelised. Roughly chop the tomatoes, pear, apple & plum and add them to the pot to saute. After 5 – 10 minutes of cooking add the vinegar along with the rest of the ingredients & cook until the fruit & tomatoes begin to break down & are cooked. Take the saucepan off the heat & blend your sauce in either a food processor or with a stick blender. Once smooth return your sauce to the stove & cook for a further 30 minutes over a low heat, stirring occasionally. Taste your sauce & adjust seasoning to suit your preference, I make mine for “Little Miss” so its a little on the bland side. Feel free to add some chilli or more spices to give your sauce that added punch. If it tastes a little vinegary at this stage don’t worry as it mellows once its cool. 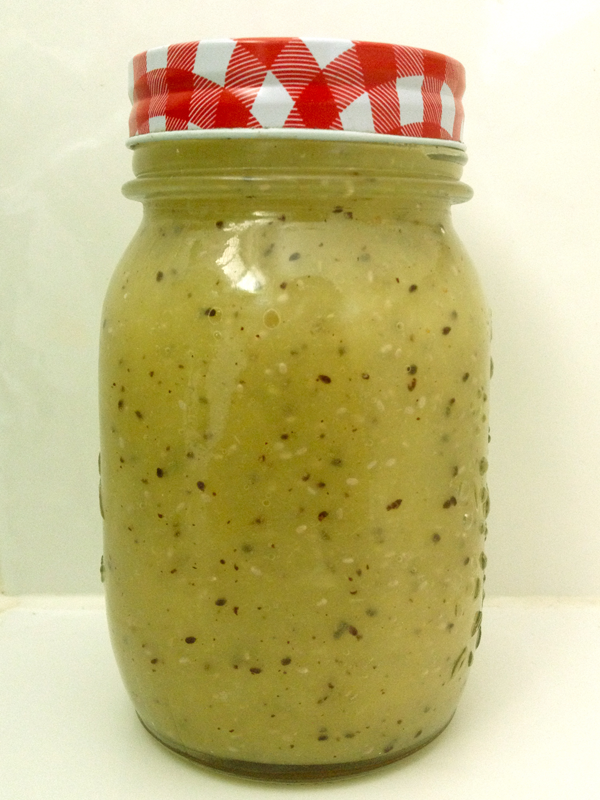 Bottle your delicious, healthy sauce & keep it in the fridge and slather that baby on everything!! This recipe makes a small bottle of sauce. We prefer to make small batches often, to ensure we don’t have spoiled sauce. But if you prefer a large batch, double or triple the recipe & enjoy sauce to your hearts content. This sauce has been in our refrigerator for 3 weeks now & is still going strong but being a natural, preservative free product it won’t last forever – not that it has any show of that around here!